…Photographing in the Blarney Stone presents some crazy lighting challenges. I have in some cases opted for flash (mainly if people want the occasional portrait group shot) but 99% of the time I’m using the existing lighting that is there… and there HAS to be lighting or else… well, how are you going to see the band? Haha. I’ve opted for very fast lenses and shooting at much higher ISO’s (like 1600 or 3200 sometimes), but I’ve found that the best technique is waiting for the rotating strobe lights to illuminate the person at the right time. My style of documentary photographer isn’t simply just blasting away frames with no consideration. I concentrate, wait for the composition, observe, breathe, move to a different angle if I’m getting nothing, feel the flow of the music, observe the rhythm of the strobe lights (they tend to operate in set sequences) and wait for it all to light up and then… click, click click! …..
As a documentary photographer who photographs many weddings, I’ve had the opportunity to observe people through the emotional tides that arises from a wedding day and it’s such a privilege to be able to be with brides and grooms in this amazing time of their lives. From anticipation to the sense of relief of having completed the ceremony (without tripping or losing the ring!) to the sense of celebration and exuberance at the celebration in the end, a wedding day is full of moments that are easy to miss in the hustle and bustle of things but are there. I’ve always focused on getting those genuine moment and telling stories through them. I don't often take photographs for/of restaurants but with my recent interest in the art of cooking and food-making AND when I saw that a friend of mine was opening up a Japanese Izakaya restaurant and I said to myself "why not?". A lot of times, when I think of restaurant photographs, I think of food photos showing the food... and really, that's about it. Here's what you can eat. Thanks. And... that's all the photos really tells you. As a documentary photographer, I felt I could add another dimension to the usual photographs of just food images and go beyond just food photographs. 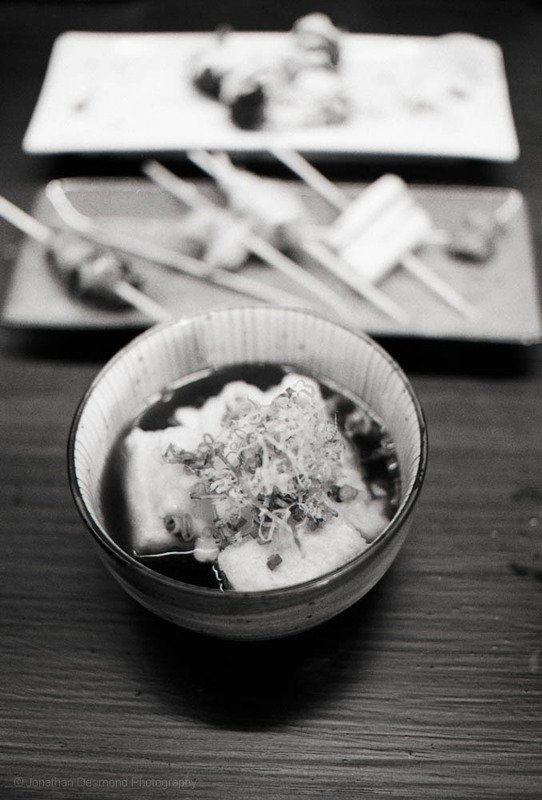 In this case, I wanted to photograph the "essence" of this Japanese Izakaya and tell their story. You see, an Izakaya in Japan is not just a a food place. It's also a place to hang out with some friends, have some great food and drinks and have a great time together, all the while trying out some very interesting Japanese food items that the kitchen comes up with. It's very social. So the challenge here was to not just take photographs of the food but to also to convey the essence of the Izakaya through the photographs and hopefully allow you to experience a restaurant on more than "just" the food. This was taken just moments before the doors opened and some customers came in to try out this new Izakaya! It was really cool to see all the staff working together as a team. Here they cheer each other on before the oncoming dinner rush. Most of the time, we delete blurry photos this like. However, in this case, I took a step back and saw my friend's smile outshining the lack of "technical perfection" of the photograph. It's one of my personal favorites. 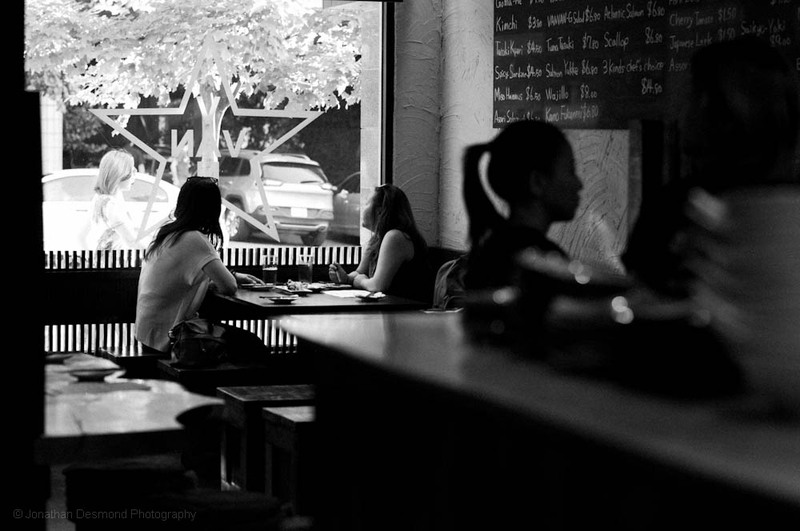 I focused on using the natural light and also the shadows to give you a sense of what the restaurant looks like. 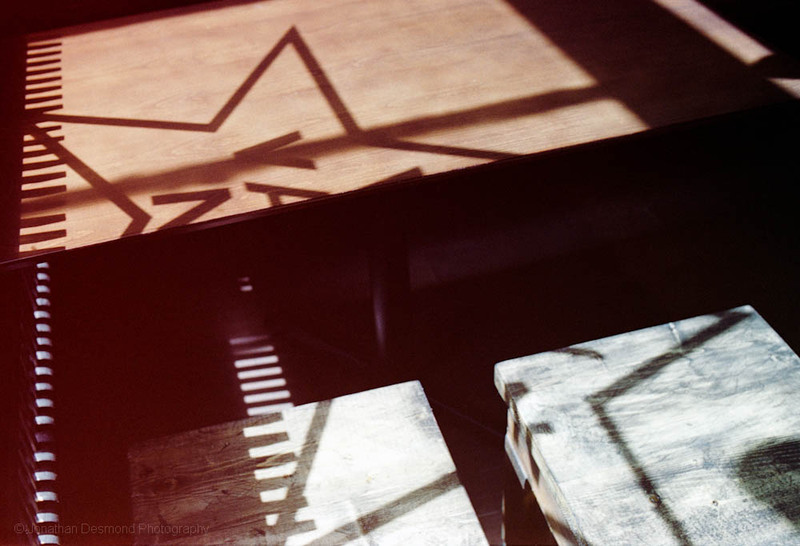 Part of the appeal of this Izakaya is the environment that you are in. Lighting plays an important part in this even if you're just sitting and eating. Blue flame torch on a slab of fish? Nice! I managed to get this image without drawing any attention to myself. Part of it was probably due to the table staff eventually getting used to me moving around a lot and taking photographs from every angle. The kitchen in action with my friend at the helm. The dishware at this Izakaya caught my attention. Having recently read the manga comic "Oishinbo", I've begun to realize the importance of the art of dishware in Japanese culture. 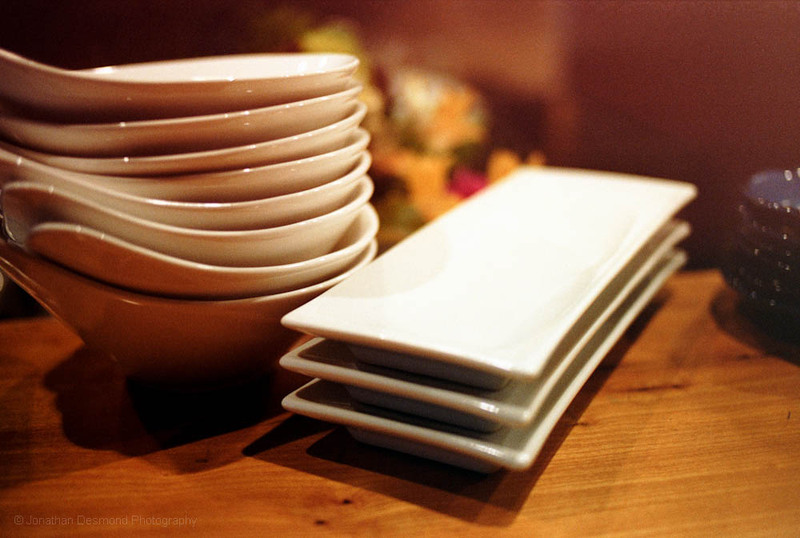 I have to admit that, in my times photographing the food and even eating the food, there appeared to be a deliberate choice in dishware that seems to compliment the style and type of food you're being served. Images were shot with ALL Pentax cameras, utilising a combination of film in 35mm format, 645 format in black and white film and color film. Digital was also used, utilising the Replichrome film presets. I used a Pentax PZ1-P film SLR camera with a Voigtlander 40mm F2 Ultron lens (K Mount), Pentax 645 film camera with 645 55mm F2.8 lens and my Pentax K7 digital SLR utilizing the DA 21 F3.2 Limited lens and the DA*55 F1.4 lens. Funny story: I was actually surprised that some of these last images in color survived. You see, I opened the back of my film camera thinking I had rewound it. Instead, I opened it and exposed it so some really harsh light! NOOOOOO!